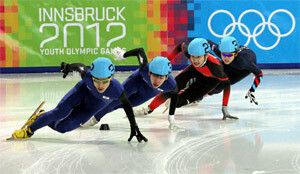 Korea’s young athletes, hopeful medalists for the upcoming Winter Olympic Games in Pyeongchang 2018, excelled at the 2012 Winter Youth Olympics in Innsbruck, Austria (www.innsbruck2012.com), exceeding the nation’s initial goal in medal contention. The South Korean team accumulated a final medal count of six gold, three silver, and two bronze -- notching up a considerable achievement when compared to its previous objective of bringing home two gold medals. Although no official medal ranking was aggregated for the youth gathering, Korea ranked third in the unofficial total, when excluding the medal table for mixed-nationality team events. With events for mixed teams comprised of athletes from more than one National Olympic Committee taken into account, Korea came in fourth place following the host country Austria, marking its all-time highest rank in an Olympic medal table. Most medals for South Korea came from short track and speed-skating events. Along with Shim Suk-hee, a double gold medalist in the women's short track, Lim Hyo-jun and Yoon Su-min each won one gold and one silver respectively in men’s short track, making a clean sweep of all four gold medals in the individual short-track events. In speed-skating, Jang Mi, a 16-year-old female sprinter brought home Innsbruck victory, clinching two gold medals. Another female skater, Jang Suji, took one silver and one bronze respectively, while Noh Hyeok Jun earned the bronze in the men’s 3,000-meter speed-skating. On January 23, more news of Korean victories came from the other side of the globe, this time in a competition for adults. At the Speed Skating World Cup in Salt Lake City, Vancouver gold medalist Lee Sang-hwa added another gold medal to her portfolio, finishing in first place in the women’s 500-meter race. From January 13 to 22, approximately 1,000 athletes aged 15 to 18 from 70 countries took part in the inaugural Winter Youth Olympic Games initiated by Jacques Rogge, President of the International Olympic Committee (IOC). During the ten-day run of the new event, the young participants not only competed in sporting events, but also celebrated the tradition and spirit of the Olympic Games, while enjoying cultural and educational programs. The youth festival also served as an occasion to discuss preparation for the Pyeongchang Olympics with the IOC. Kim Jin-sun, President of the Pyeongchang Organizing Committee for the 2018 Olympic and Paralympic Winter Games, met with Rogge and other high-level IOC members on January 23 to share the progress. Earlier on January 17, a national rally pledging the success of the Pyeongchang Olympics was held in the alpine county of Pyeongchang. President Lee Myung-bak led the proceedings in the nation’s united wishes for the successful staging of the 2018 Winter Olympics. Nearly 3,000 Pyeongchang Olympic supporters and local citizens converged at Alpensia Resort, alongside participation by leading figures and government executives including Pyeongchang Organizing Committee President and former Governor of Gangwon Province Kim Jin-sun, as well as the incumbent Governor Choi Moon-soon. During the ceremony, President Lee awarded the Order of Civil Merit to individuals who played an instrumental role in successfully hosting the bid, including Olympic champion and Pyeongchang 2018 Bid Ambassador Kim Yu-na, Pyeongchang Bid Committee Chair Cho Yang-ho, and Olympic Committee Chair Park Yong-sung Korean. Following the national rally, the Ministry of Culture, Sports and Tourism hosted the second part of the awards ceremony for bid contributors on January 20 at the National Folk Museum of Korea. Korean-American skier and Olympic bronze medalist Toby Dawson who also served as honorary ambassador received the Order of Civil Merit in recognition of his contribution that day, alongside awardees of governmental merit awards. During the congratulatory address, Minister of Culture, Sports and Tourism Choe Kwang-shik displayed his passion and reiterated his full commitment to making the Olympic event in Pyeongchang a historic legacy. “Following the 1988 Seoul Olympics and 2002 Korea-Japan FIFA World Cup, Korea will once again strive for success in hosting the Pyeongchang Olympics in 2018 -- which is expected to foster national unity and an enhanced national image,” said Minister Choe. Meanwhile, the Pyeongchang Organizing Committee will organize a coordinating committee in Pyeongchang with the IOC this March to deliver status updates on the preparations and ensure the successful organization of the 2018 Olympics.